Ms. Donohue-Saltman is the co-owner and director of Camp Encore/Coda in Maine. She had a B.A. from the University of Massachusetts and a Masters of Music from the New England Conservatory of Music. She has been teaching music for 28 years to students in Lexington, Weston, Foxboro and at the N.E. Conservatory Preparatory School. She is a founding member of the Ariel Quintet; has performed on WGBH and done a great deal of freelancing in the Boston area. 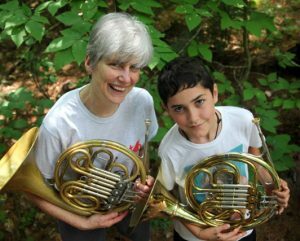 Ms. Donohue-Saltman is a member of the International Horn Society and the Boston Musicians Association.